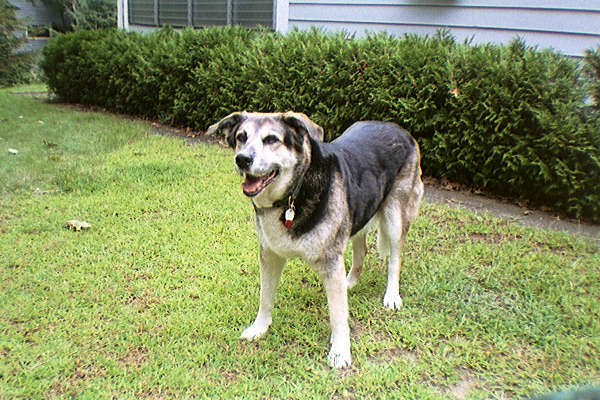 Pluto is a lab, shephard, husky mix, born in March of 1986. Pluto left his first family in the Fall of '94 when he was brought to Buddy Dog, a local shelter. In May of '95 we brought him home. He is a terrific dog and we are so glad we get to share this second half of his life! If you are interested in adopting a dog or cat of your own, check out your local shelters and/ call Buddy Dog, in Sudbury, Massachusetts. Buddy Dog is a no kill shelter meaning it will not euthanize any of the animals it takes in. Also try the MSPCA (Massachusetts Society of Prevention of Cruelty to Animals). Over 30,000 pets are brought through their shelters each year. They also provide background information on pets if they can. Last September Pluto participated in his fifth Mutts and Stuff Day, an annual event, usually the second or third week in September, which includes a dog walk and pet show to help raise money for the MSPCA shelters throughout Massachusetts.